John Branyan continues to delight audiences across the U.S. with his quality, style and "gift of wit." He has been an improv player with Think Tank and has performed at Jay Leno's National Comedy Competition." John is also a talented writer whose credits include the American Comedy Network and head writer for Clip-Wit radio humor service. In addition, he is co-writer and performer in the successful theatrical presentation, CRAZY LOVE. 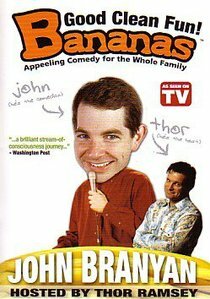 About "Bananas Featuring John Branyan"